In order to increase competitiveness as well as to attract more investors and increase the occupancy rate, the management boards of Long An’s industrial zones have been constantly investing in their infrastructure to facilitate investors, with Long Hau Industrial Zone (at Long Hau Town, Can Giuoc District, Long An Province) being a special example. Developed as a combined model of industrial and urban zones, Long Hau Industrial Zone not only serves as a manufacturing site but is also a modern urban industrial zone. It is considered as a leading project of a strategic movement co-created by Tan Thuan Company of Agricultural Development and Viet Au Joint-stock Company. As planned, Long Hau Industrial Zone has a total area of 425 hectares; including 137.02 hectares of existing industrial zone, 108.48 hectares of expanded zone, 123.98 hectares of Long Hau Industrial Zone 3, and 55 hectares of residential area. As present, there are more than 160 investors renting at Long Hau Industrial Zone, with 50% Vietnamese businesses and 50% international businesses from various countries and regions such as Japan, Korea, USA, France, Spain, Singapore and many other South-east Asian countries. The geographical location of Long Hau Industrial Zone allows for easy access to the well-developed infrastructure, labor force, services and consuming market of Ho Chi Minh City (HCMC); together with the convenient transportation network connecting the Southeast region with the Mekong River Delta. Moreover, the Industrial Zone is surrounded by Kinh River connecting to Soai Rap River, which is the most important water transportation channel of HCMC; about 3km away from Saigon Premier Container Terminal and Saigon – Hiep Phuoc Terminal. Long Hau is becoming a hot spot of logistic and import-export investment. In addition, Long Hau is only 12km away from Phu My Hung Urban Area, 19km from the central of HCMC and 25km from Tan Son Nhat International Airport; making it convenient for high-quality labor force and foreign professionals to come and work in the Industrial Zone. These unique advantages have led to the increasing number of investors into the Industrial Zone. Among 160 businesses that are attracted to Long Hau Industrial Zone, there are famous names such as Lotte Sea Logistic (Korea), Simone handbag (Korea), Takazono Vietnam (Japan), Avery Dennison Ris Việt Nam (USA), Clevie (France), Sasco, Topcake, Nipponham Vietnam, and so on. From the very beginning, Long Hau has given special consideration to attracting small and medium businesses with high efficiency and environmentally-friendly production process. Long Hau’s management board firmly believes that the quality and reputation of its investors play a key role in the Industrial Zone’s vitality. Therefore, we have built our customer services based on the strictest standards of Japan and Europe; so that we can tailor our service to each business’s needs and facilitate their competitiveness and connectedness. We also provide the best environment for their production; for example by building residential area for employees, facilitating in recruitment and training, providing legal and healthcare services, etc. More importantly, Long Hau is always proactive in protecting the environment and abiding by environmental laws. We have invested in sewage treatment plants and environmental management system. Long Hau is one of a few companies that are certified with ISO 14001:2004. With a goal to develop a green industrial zone, Long Hau promises to assist the businesses and investors in protecting the environment. This promise is also the reason why Long Hau Industrial Zone is more attractive to investors, as said by Mr Bui Le Anh Hieu – Marketing Director of Long Hau Joint-stock Company. In addition, Long Hau’s management board also organizes events such as monthly meetings with businesses and regular visits among different plants to encourage cooperation and strengthen the relationships between investors and managers. Talking about the investment environment at Long Hau Industrial Zone, Mr Munehito Kiriyama – General Director of Takazono Vietnam Company Ltd said: “After researching the investment opportunities in Vietnam, we have decided to choose Long Hau Industrial Zone due to its prime location for export (our products are 100% exported to Japan). The transportation is convenient and time-saving, and most importantly, the leasing fee at Long Hau Industrial Zone suits our financial capability. During our time here, Long Hau has supported us in many aspects, providing labor recruitment, legal advice, clean environment and unified infrastructure. As a result, after a short time investing at Long Hau, our company has achieved positive operational efficiency and we are planning to expand our network in Vietnam in the near future”. 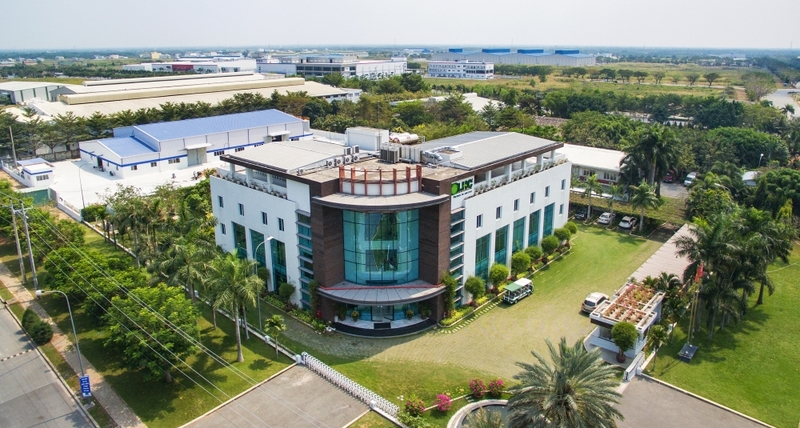 Hoang Duc Pharmaceutical & Medical Supplies Co. Ltd. has a project of building a pharmaceutical storage and distribution plant in the Industrial Zone, with an area of 17,000m2. Mr Nguyen Vu Hoang Trung – General Director said: “We want to build a modern, standardized pharmaceutical distribution center to provide high-quality medical supplies and services. The infrastructure of Long Hau Industrial Zone as well as the prompt assistance of management board has helped us implement our project in the most effective way. The project is expected to go into operation in November 2017”. Apart from efficient resource exploitation and production, Long Hau Joint Stock Company also actively promotes social and environmental programs, such as helping children in poverty go to school, creating a supporting fund for workers, taking care of war mothers, building community houses and so on. These efforts have gained Long Hau JSC many prestigious awards: Second-class Labor Medal, 02 National Quality Gold Awards, Asia Pacific Quality Award, 4 Awards for Environmental Protection, and many others by national and local committees. Perhaps the secret to Long Hau Industrial Zone’s success lies in its human and technical harmony. This includes the consensus of the management boards and the workers to reach the mutual goals of the Industrial Zone’s development. In addition, apart from its convenient location, Long Hau also has advanced technical infrastructure and is known as a green industrial zone. These factors play a significant role in the success of Long Hau Industrial Zone nowadays.